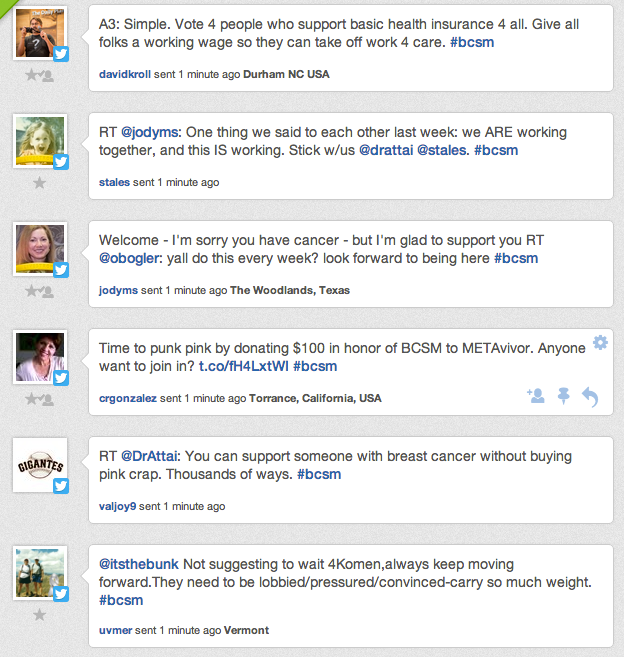 Yesterday, Monday Oct 8, I participated for the first time in the #bcsm tweet up. #bcsm stands for breast cancer social media, and I learned a few days ago that every Monday evening at 8 pm central a group of people get together for a conversation, which is organized and can be joined simply by adding in the hashtag. It was fun! And it is also a good example of the power of Twitter. People often ask me why I tweet (and I don’t very much, certainly when compared to the people with the big numbers), and the main reason is that it is an amazing tool for people to find others with common interests. It is like millions of people hollering into an immense, crowded room, and you can certainly here those close by – your followers and those you follow – but everyone also has tremendously selective hearing, so that you can focus in on just those things that interest you. Twitter is not about sharing what you had for lunch. It is for instantaneously connecting people across large distances who have a shared interest. Type in any word, pretty much, and find people across the world talking about it. This evening the conversation focused around the use of pink to raise awareness and raise funds to battle breast cancer. Not surprising, considering we are in the midst of breast cancer awareness month, and the country is covered in pink. I am watching an NFL game, and there are pink gloves, boots, hats and t-shirts galore. Many in the group thought that the pink had gone too far, and was exploitative. Many questioned where the funds were going and to what end. They pointed out that putting on something pink was a poor substitute for doing something concrete that really impacted breast cancer, and that at the same time there were lots of things that could be done that could be impactful and didn’t require buying or wearing anything pink. Some said that seeing pink, rather than encouraging them or making them think that they were supported, made them feel sad and disappointed. I think agree with much of what was said – it was eye opening. I guess that I am still early enough in my journey, and optimistic enough at present so that I do feel that pink events are overall a positive thing, and just hadn’t given it all that much thought. I also agree with the many who argued that the concerns shared today are only possible because awareness has been so successful. Today’s conversation is very different from that of 20 or 40 years ago, in so many ways, but most pertinent is the removal of the stigma of cancer. I can’t imagine sharing about my situation as freely as I can today, even 20 years ago. We owe much of that to the foundations who started the awareness campaigns, and made it possible for us to talk about our disease with friends and colleagues. Similarly, the concerns about where the raised money is going is legit, but lets face it, the activism community in the US raises amazing amounts of support for worthy causes, including cancer research. Of course, you have many options, a considerable amount of transparency and always the option of cutting out the middle person, and giving straight to your trusted academic program (disclosure: I work for MD Anderson Cancer Center which receives lots of donations for research programs). So, I am glad to have found a new community, and plan to engage and learn more. Even at 5 tweets a minute! This entry was posted in my journey and tagged community, socialmedia, support. Bookmark the permalink. Welcome to #BCSM. Thanks for joining us last night. I’m sorry to hear that you’re going through this right now. The #BCSM community will support you every step of the way. Take care and please feel free to reach out – if I can do anything to help, I will!